Vertical gardening may sound like an unusual concept, but there are plenty of ways to actually do it. This method has grown more popular lately, since it allows the gardeners to save more space in the backyard as well as to facilitate the harvesting process. The vertical method is particularly recommended for growing cucumbers, because otherwise, they take up a lot of space. 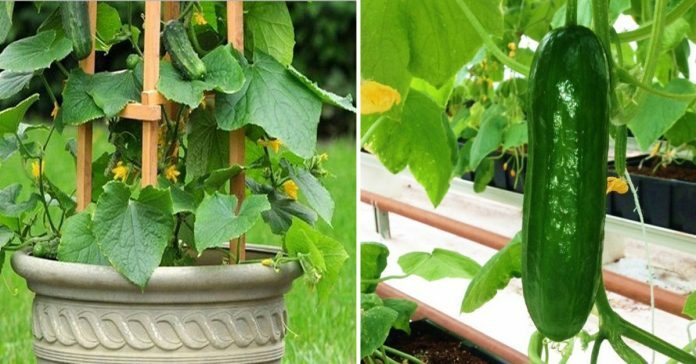 Read on to learn how to grow your cucumbers vertically and ease your everyday chores. Cucumbers can usually occupy on 12 to 20 square feet if they are planted the old-fashioned way. By growing the vertically, you can save plenty of space, and you could do this by using raised beds, containers, or small plots of land. To do this right, you will need a big container around (around 12 inches deep and wide). Since cucumbers can be of different kind, they are treated differently as well. For example, if you grow a vining type it will grow tall, and if you grow a bushy variety, it will remain short. In order for it to grow, the cucumber needs height support, which you can enable by setting up a wire mesh fence, garden netting, or trellis. If you decide to go with trellis, make sure to find ones high up to 6 feet maximum. Keep in mind to pick a stiff trellis so it doesn’t bend. When you place it, keep the lower edge 6 inches above the soil level. When you do this, you alleviate the weeding and cultivating process. Also, place the trellis in the furthest part of the yard, so the vines do not throw shadow over the remaining plants. It is truly important to keep the soil ready for planting. First, you need to dig an 8 inch hole in the solid. Next mix in 1-inch layer of compost while tilling the soil. You can do this by using steady garden rake and mound the soil along the trellis line. This step is relevant, because it raises the planting bed for 2-3 inches above off the ground. Here, the first thing you do is to sow the seeds. You have to sow them either in the pot or directly in the marked spot. Cover seeds by using 2cm of soil. Next, you have to let the seeds germinate. When this process is done, you will notice the seedlings growing leaves, you you’ll need to transfer them. Start with the healthiest seedlings and transfer them to a larger pot or on the frost-free ground. The best period to do this is in spring or summer, so you have the most favorable temperature (the ideal temperature would be 70 F (20 C)). But, if you leave in warmer areas, you do not have to wait for these seasons, since you have ideal climate throughout the year. If you want, you can throw in decomposed manure in the soil. The cucumbers have to be exposed to sunlight as often as possible. Also, the wind is not very friendly towards them, so make sure to keep them safe. If you are in a 50 F (10 C) temperature or lower, the cucumbers will not grow. The ideal temperature to do this properly is from 60 – 95 F (15 – 35 C). Make sure the soil you plant the cucumbers in, is dry, deep, and loose. The soil has to also be organic and asks for pH neutrality. It is crucial that water is available at all times when growing cucumbers vertically. Water cucumbers deep and at all times, so the soil is moist. Furthermore, you will need to perform irrigation equal to an inch of rainfall every three to four days. If you leave in a drier area, do this more often. Just when the vines start to ripen, you have to increase the mulch to 3-4 inches deep. Also, remember to keep the foliage away from the water, so you avoid fungi from occurring. When growing cucumbers vertically, you will have to use fertilizer, placed slowly into the soil. The vines should be fertilized every two or three weeks. The first plant flowering is an indicator that you need to treat them with aged manure. As an alternative, you can use diluted liquid organic fertilizer right at the root. Do this along with the plant watering. The plants must not be overfed though, because it will ruin the foliage and will result in less fruits and flowers. The cucumbers are best kept picked, so you encourage the vines to grow, blossom and produce more. Let’s not forget the pests that have to be kept away from the cucumbers at all times.